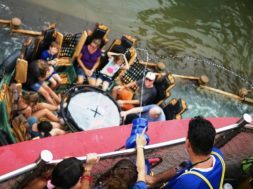 Universal knows the value of not just a great vacation, but also loosening up and having a good time with your family and friends. 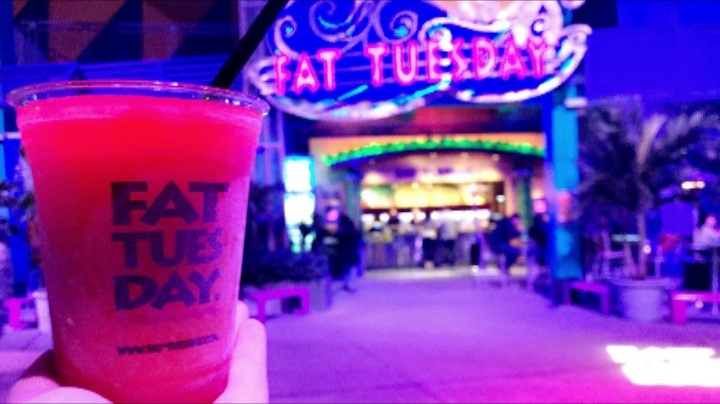 Being a trusted adviser and patron of such things in the parks, I took on the oh-so-strenuous task of finding the best of what’s offered in the way of Universal Orlando Resort’s adult libations. I based my criteria on the value of your invested dollars (about an average of 9 to 13 of them) not just in regards to the typical generosity of the “pour” or the cocktail’s potency, but also in its craft and flavors. 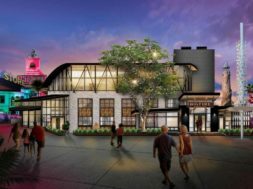 To that end, I present the five best choices of both of Universal’s major theme parks, CityWalk, and the on-site hotels. Please feel free to do your own research and compare notes – this is a science, after all! Let’s start where many Universal Orlando vacations do: at The Wizarding World of Harry Potter. 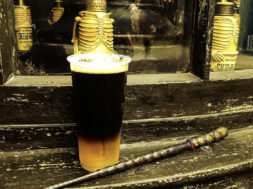 Available in the Hog’s Head Pub, the Triple is a layered concoction combining cider and two types of beer – Strongbow Cider, Hog’s Head Ale, and Guinness – in a wonderfully attractive display, with a look and flavor similar to a traditional Snakebite (cider bottom, Guiness top, and ale center). 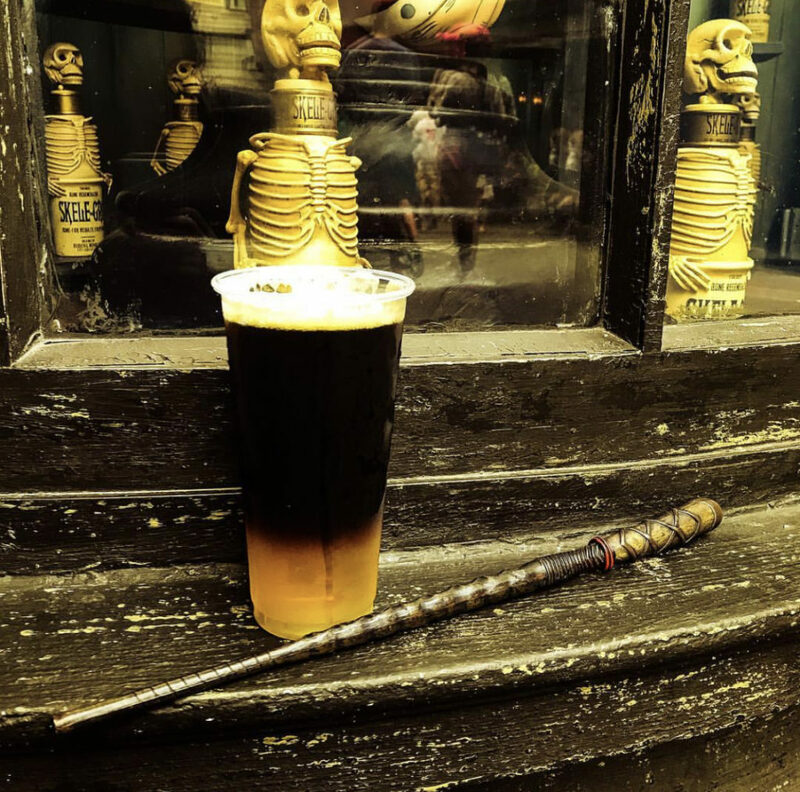 This drink is a refreshing break in your day at the parks, but it can be a tricky order, as it’s technically on a “secret menu”; its former nickname of Deathly Hallows isn’t officially recognized by the Wizarding World’s Ministry, and asking for the Triple doesn’t always work. That being said, you can easily just tell the bartender what you want, and he’ll happily make it for you. UPDATE: we’ve been told that not even the new name of “the Triple” will work at the Hog’s Head now – you’ll have to ask for “the Three-Layer Beer,” and then give specific instructions as to what those layers are. No list of this nature is complete without a stop at everyone’s favorite watering hole, Finnegan’s – while the average wait for service can vary here, it’s always worth stopping in to take in the pub scenery and the live music. Its drink menu is extensive, similar to most anywhere on property, so I wanted to narrow it down to the best option – and after speaking with other patrons and the bartender, I found the fan-favorite here to be Mummy’s Revenge. 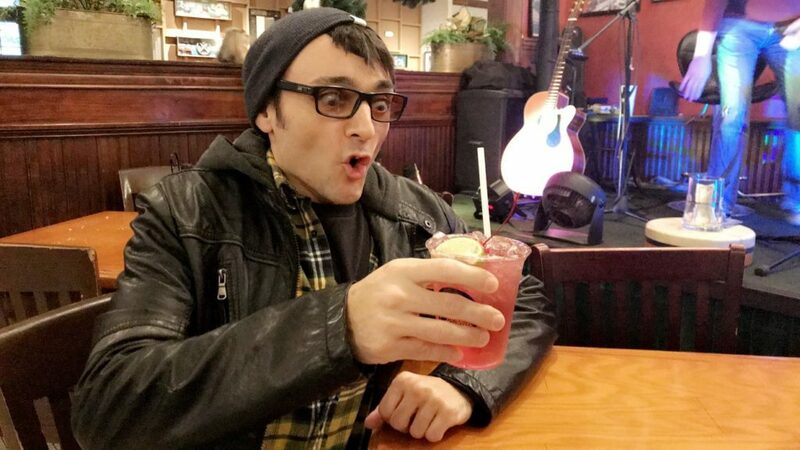 This drink is possibly the easiest form of Universal’s potent potables to enjoy – it’s a generous mixture of Chambourd, vodka, Triple Sec, and sour mix. With its Chambourd base, it has tropical/berry flavors that mingle with the Triple Sec, creating a dangerously tasty temptation. Much like the ride of its namesake, if you aren’t careful, this one can be a quick-hitter that not even the Medjai can save you from. Moving over to CityWalk, it’s worth noting the abundance of choices available here. 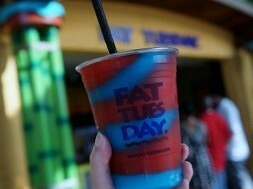 Fortunately, I was able to pull out the two best all-around drinks, the first of which is the 44 Magnum from Fat Tuesday. This frozen infusion combines the establishment’s heavy-hitting, signature recipe, called 180 Octane (a delightful orange blend of grain alcohol and 151), with the ever-popular Cat 5 Hurricane mix. While all their mixes include 151 rum within the ingredients, this is the only official combination to include grain alcohol. Its delectable blend of citrus flavors makes the Magnum a great way to either pre-game your night’s adventures or to break away from your day at the parks. Now, we all know about the acclaimed reputation of the next-door Margaritaville’s namesake, but we shouldn’t let Antojitos’s own formidable menu go overshadowed – especially when it comes to this little beaut. On the surface, the Stingray is simply a jalapeno margarita. What makes it different from similar cocktails, however, is that the jalapeno bite is typically already infused into the tequila during production, allowing for a quick, pour-mix-and-serve preparation. 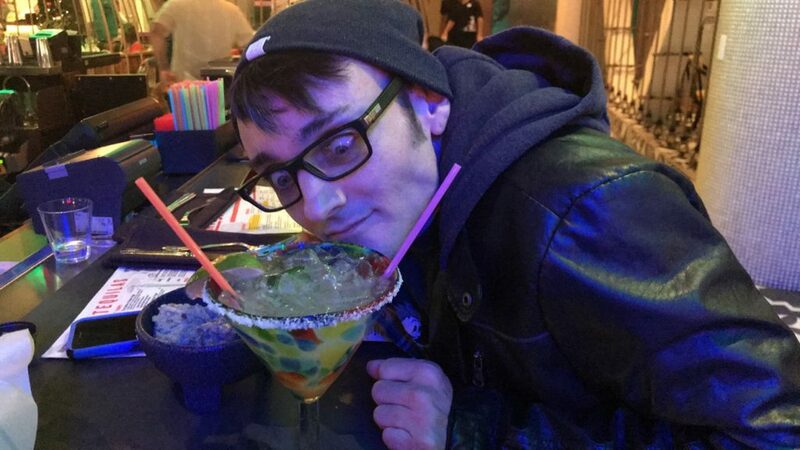 In speaking with the bartender, I requested him to prepare it by their standard measures, and while the bite of jalapeno was notably there – dancing playfully with the citrus flavors and the drink’s sour mix – I found that I would have preferred it to be a bit more prominent. But herein lies the beauty of Antojitos’s made-to-order craft – guests can have the bartender make this margarita to their liking. Before shifting to the on-site hotels, I should take a moment to preface this part by noting the difficulty in defining what makes a “craft” cocktail. There’s a lot to consider here, such as the quality of ingredients, the time and care put towards its conception, the preparation, and, even, the finishing touches in its presentation – and there’s even more to consider when deciding if it’s worth the cost. 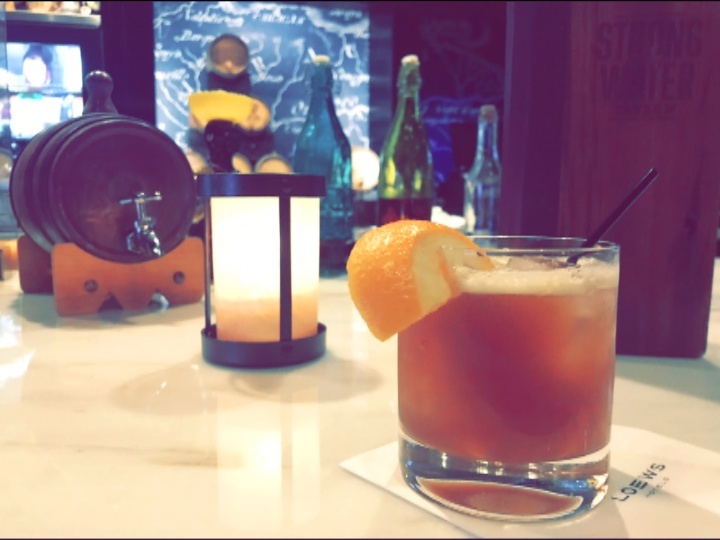 The Tavern Grog at Sapphire Falls Resort’s Strong Water Tavern, in this writer’s humble opinion, is a fine example of all those elements. The drink infuses a muddling of lime and orange slices that is shaken with a mix of the bar’s Strong Water white rum, allspice dram (a pimento-berry-and-rum-based bitter), and demerara sugar simple syrup (a darker-brown sugar flavor), which is poured into an old-fashioned glass, then garnished with another orange slice and a cinnamon stick (yes, we know it’s missing from our picture, but trust us when we say that it’s usually there). The flavors mingle with each other in a wonderfully-subtle-but-highly-enjoyable fashion, making this another sneaky, potent cocktail; sipping would be encouraged for proper, overall enjoyment. With my research now concluded, I can confidently state these are the Universal drinks most worthy of consumption. If, however, there’s something you think we missed – or a cocktail that you feel deserves a mention – go ahead and share it with tens of thousands of other Universal fans in our OI Community on Facebook. previous Does Universal Studios Florida have a studio tour like Hollywood?